As we know less than two weeks ago Secretary of State John Kerry and Russian Foreign Minister Sergey Lavrov worked out a cease fire plan for Syria. That plan was shattered when US planes bombed and strafed the Syrian army base near Deir Ezzor this past weekend killing more than 60 elite Syrian troops, wounding more than a 100. When the Syrian government accused the US of the attack being deliberate the US called it an "accident". Finian Cunningham's latest piece, "Why US Had to Kill Syrian Ceasefire"  , puts it all in proper perspective "concluding that the US-led air strike on the Syrian army base near Deir Ezzor last weekend was a deliberate act of murderous sabotage". "The compulsion to wreck the already shaky truce was due to the unbearable exposure that the ceasefire plan was shedding on American systematic involvement in the terrorist proxy war on Syria." "This pretense by the US-and its other NATO and Arab allies-of supporting 'moderate rebels' and of having no involvement with recognized terror groups like Al Nusra and Daesh (ISIS) was being exposed by the latest ceasefire." "The foundering ceasefire was thereby providing a withering exposure of American terrorist complicity in Syria. The US lie about backing 'moderates' as opposed to 'terrorists' was being shown once and for all to be a cynical delusion...an utter sham. That leads to an even more damning conclusion that the US government is a sponsor of a terrorist proxy army in Syria for its criminal objective of regime change in that country." US policy on Syria can only be described as fomenting chaos, keep the conflict simmering till as expected (or hoped for) a Clinton presidency in January will escalate the conflict further, all with the intent of bringing regime change. Meanwhile create diversion-accuse Russia, Syrian President Bashar al Assad's government of initiating an incident, get it's complicit corporate MSM to regurgitate it 24/7 as been done with the latest attack on a UN humanitarian convoy blaming Russian and Syrian planes for bombing the convoy -no evidence provided. 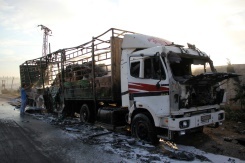 Meanwhile evidence of the wreckage was provided by the Russian media showing, "All of the video footage demonstrates that the convoy caught fire, which strangely happened almost exactly the same time militants started a large scale offensive on Aleppo". There was no evidence of craters from a bombing attack yet the US insists, again without providing any evidence, Russian and Syria planes bombed the convoy. Once again these incidents and how they are presented show the US and its corporate MSM are duplicitous, can't be trusted to reveal the facts as they actually happened. The facts of any incident are twisted, the latest convenient "enemy" of the moment is demonized and accused, all with the calculating intention of misrepresenting it all to the public-nothing more than propaganda. That's today's America folks even if many (most?) American's can't bear to acknowledge it.